ANNVILLE, Pa. - Lebanon Valley's football program handed out its postseason awards at the team's annual banquet on Sunday afternoon, Jan. 14. As it does every year, the event remembered the team's most recent campaign and honored the program's senior class. Pirrone has been LVC's most potent offensive weapon the past three years. His versatility has proven his most valuable asset and he has worked his way into many a formation, whether at wide receiver, running back, quarterback, and kick returner. This fall, the senior was the squad's top receiver with 33 catches for 354 yards and five touchdowns. He also rushed 46 times for 301 yards and a pair of scores on a team-high 6.5 yards per carry. Pirrone's seven total touchdowns were the most of any skill position player. Schumacher had a breakout senior campaign for LVC. The linebacker ranked tied for second in the nation with five forced fumbles and was tops among Dutchmen with 59 total tackles. He made 37 solo stops, including 5.5 tackles for loss and 0.5 sacks. He added two interceptions to go along with one fumble recovery and a quarterback hurry. Schumacher was named the ECAC South Player of the Week and MAC Defensive Player of the Week thanks to strong performance in a win over Stevenson that saw him force and recover a fumble, as well as come away with a pick. He was named Second-Team All-MAC for his efforts. Hodges has proven a special teams ace for the Flying Dutchmen in each of the past two seasons. After being named the MAC Special Teams Player of the Week for the first time in November of 2016, he repeated the feat following a win over Stevenson in October. He has also been named to the D3football.com Team of the Week for his stellar special teams play. Hodges finished the year with 27 tackles, a forced fumble, a fumble recovery, and one punt block. Van Horn started all 10 games at right tackle this fall and graded out as the team's top offensive lineman. He was a key cog in an offense that led the MAC in time of possession and a run game that ranked second in the conference with 160.1 yards per contest. The senior was also strong in helping anchor an offensive line that surrendered just 14 sacks on the year. He was named First-Team All-MAC for his efforts. Jones emerged as the top tailback for the Dutchmen, rushing for 435 yards and three touchdowns on 127 carries this season. At 5-10, 232 pounds, the bruiser never shied away from lowering his shoulder and taking on a defender to gain extra yards after contact. The senior's best outing of the fall came in a victory against Lycoming during which he tallied 116 rushing yards on 24 attempts. He added one catch out of the backfield for 21 yards in a win over Stevenson. He earned a spot on the All-MAC Second-Team in the fall. Salcedo was another of Lebanon Valley's top special teams players this fall. The senior recorded a pair of tackles on kick coverage and recovered a fumble against King's in September. 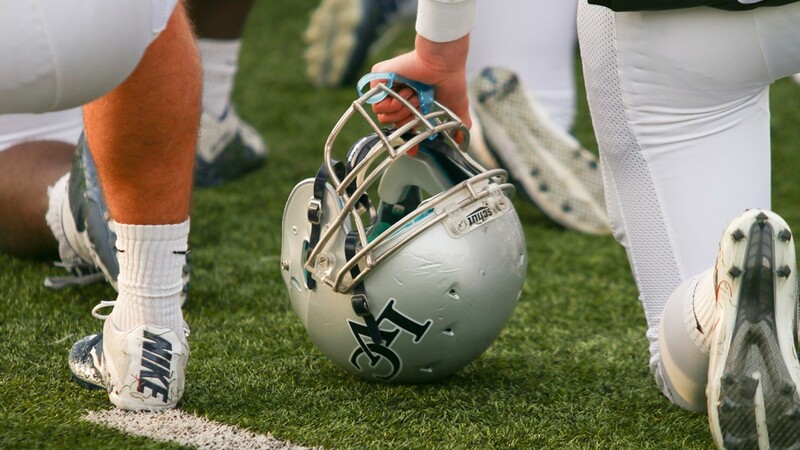 The Jim Monos Award is voted on by LVC players and given annually to the player who shows the most enthusiasm for football and the team in practices and games. Clark proved LVC's most versatile pass-catching threat at the tight end position this fall. During his sophomore season, he made six receptions for 99 yards to post a 16.5 yards per catch average. He also earned a spot on the MAC Academic Honor Roll this fall. The Scott Wallace Memorial Award is given to a returning team member in good academic standing who displays exemplary play and leadership on the field. Werner appeared in all 10 games at guard and was a key piece of an LVC offensive front that cleared the way for a running game that produced more than 160 yards on the ground per outing. He helped move the pile for all-conference second-teamer Jon Jonesand created holes that allowed Dutchmen backs to scamper for 13 rushing touchdowns on the season. The Service Player of the Year awards are given to players who show outstanding dedication and drive in helping the varsity team prepare for their opponents in practice. Olson, Layton, Martz, and Fischer were all invaluable to the team in mimicking opponents' schemes in practice during the week.